As the world begins to descend on Las Vegas in preperation for this year's Consumer Electronics Show, we're starting to see some of the big tech reveals we've been clamoring to get our hands on. Such as this, the new VR headset from Lenovo. It's been hinted it and teased since last year, but we're finally getting a few key tidbits on what Lenovo is planning with its first foray into VR. For a start, the headset is going for a more streamlined approach with a weight of around 350g being targeted. That's noticeably lighter than the HTC Vive or Oculus Rift, but it will nonetheless come with 1440 x 1440 OLED display panels, giving a higher resolution than its established competitors. The new Lenovo headset will also work with Microsoft's planned Holographic Platform, with two cameras fitted to the front of the headset to include both augmented reality and regular VR experiences. So while it might not have the power of those high-end models on the market, it's going to potentially over a mixed reality experience with a price tag that won't make you choke on your coffee. It looks like Lenovo will be aiming at a range between $300 and $400 dollars, bringing it somewhere between £300 and £350. 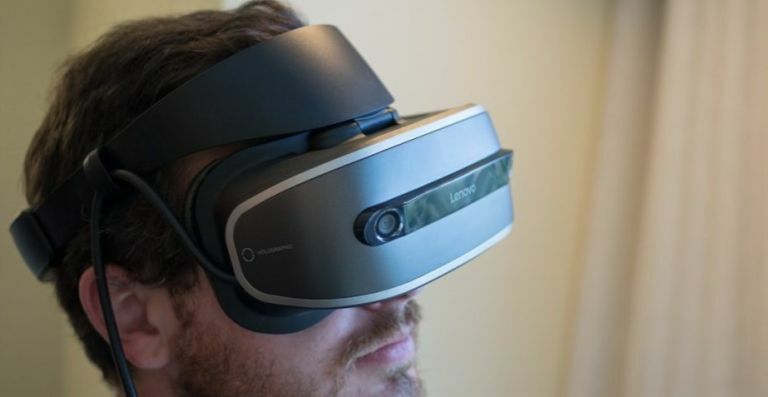 And with a design not too dissimilar to PlayStation VR with a visor that hangs its displays off the forehead rather than binding it around your face, Lenovo's take on VR could be a great mid-range option.